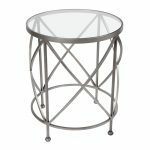 The Juliette Iron Table Petite is the perfect side table for the bedroom or as an accent table to give an eclectic touch to your living space. A Clear Glass top and hand finished iron base. The Juliette table is also available in Grande.